One April morning in 1943, a sardine fisherman spotted the corpse of a British soldier floating in the sea off the coast of Spain and set in train a course of events that would change the course of the Second World War. Operation Mincemeat was the most successful wartime deception ever attempted, and certainly the strangest. It hoodwinked the Nazi espionage chiefs, sent German troops hurtling in the wrong direction, and saved thousands of lives by deploying a secret agent who was different, in one crucial respect, from any spy before or since: he was dead. His mission: to convince the Germans that instead of attacking Sicily, the Allied armies planned to invade Greece. The brainchild of an eccentric RAF officer and a brilliant Jewish barrister, the great hoax involved an extraordinary cast of characters including a famous forensic pathologist, a gold-prospector, an inventor, a beautiful secret service secretary, a submarine captain, three novelists, a transvestite English spymaster, an irascible admiral who loved fly-fishing, and a dead Welsh tramp. Using fraud, imagination and seduction, Churchill’s team of spies spun a web of deceit so elaborate and so convincing that they began to believe it themselves. The deception started in a windowless basement beneath Whitehall. It travelled from London to Scotland to Spain to Germany. And it ended up on Hitler’s desk. 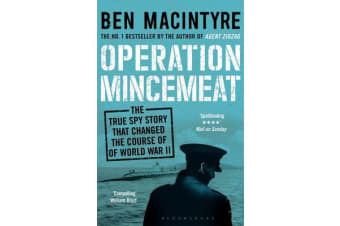 Ben Macintyre, bestselling author of Agent Zigzag, weaves together private documents, photographs, memories, letters and diaries, as well as newly released material from the intelligence files of MI5 and Naval Intelligence, to tell for the first time the full story of Operation Mincemeat.